I can never understand why I see so few homes using solar panels here . I suggested it to my wife and builder today and that idea was shot down reasons not worth it costs to much and government does not like you using them(they own electric supply ) they must be talking crap.Anybody on this forum fitted solar power to their homes my question is it worth the cost and hassle of installing, have you seen a saving in your electric bill that made you happy with installing solar power . Lecky is cheap for me the rest of my family are on 5/15 supply which they get free, it doesn't come any cheaper than that. I agree with the kawasaki its down to the lekky price. Ironically Uk citizens must be mugs, spending at least 5k bt a month on electricity, they fall over themselves to take up offers of solar panels on their roof. Someone I know who lives near, spent a large amount of money on an entire roof full of approx 2ft x 4ft panels, I wont go through the whole story but the bottom line. It never worked, wasnt installed right, never had the agreements or connection to the "grid" promised , they didnt even exist and werent allowed either. All the promises turned to sh** and it was a complete con job, he got taken for a ride. He took them to court, got 300k judgement but has never been able to collect and now has, as last I knew, a shed full of around 40+ unused German solar panels. 300w panels (big 2m x 1m) cost just under 5kbht from Amorn in most Tesco buildings. well it takes five years to get your money back (assuming they work) and I only have a 90 day VISA. All my 'investments' in Thailand are now determined by the length of my VISA. When you do it to save money, forget it. Yes it is worth it!350 watt panel now for around 5000baht. Payback time is 6 years but in 6 years elec.will be more expensive. If intrest was high it may be a different story but money in the bank costs money at the moment. There are some very good companies around. Get informed so you can form a better opinion. Solar for an entire home that has reasonable access to PEA might not pencil out in 2019. Solar DC deep well submersible bore hole water pump, a control box, mounting stands and three panels can make perfect financial sense to pump water where the water needs and/or well is in a remote area. 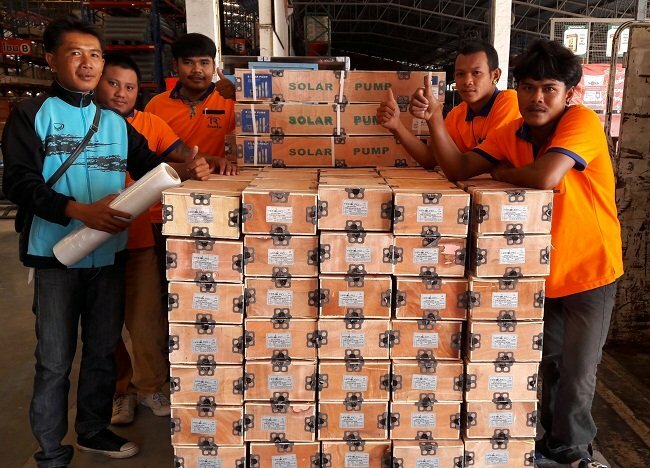 I am told that over 100 deep well bore pumps powered by three solar panels sell every week in Buriram in just one store. There are several solar shops in Buriram. This might be a common solution to pumping water in other provinces in Thailand. The fairly low price of electricity in Thailand works against off-grid solutions being economical. Anything imported will not be cheap here, and then you have the problem of finding someone who actually knows how to install and maintain the things, as mentioned. But above all, most Thais simply dont see the point of spending 10B today to save 12B tomorrow. They are corner-cutters and penny-pinchers who would rather save 1B today and lose 10B tomorrow. As stated, the numbers just don't work to make installation feasible, when I built house, I built in an area for installing solar panels, but - when you start to dig deeper, just not worth it & my electric bill averages around 5k a month. 5 years ago I thought I will leave it for a while and see how things progress - there has been little progression and prices still way too high. I agree with Bob, Solar well DC pumps are a good way to start and I am very happy with mine. The last price I paid for solar panels was ฿3,900 for 320w. I will be installing a full solar PV system on my new house build this year, but I agree with previous comments, if the only reason you are doing it is to save money, you are probably better to wait for more components to be manufactured in Thailand and avoid costly import duties. The regime here require that you get a BOI license, a power production permit and a controlled energy production license (which can be acquired from the Energy Regulatory Commission) even if you have only one panel on your house. Whether it would be enforced or not is another matter. Just not worth the hassle or the cost. I looked at it in the UK. It's about a 7-year payback if I remember correctly. The best method in the UK to me is an underground heat pump for central heating and possibly one solar panel to do your hot water.